George Frederic Handel was born on February 23, 1685 in Halle, Germany. His father was a barber surgeon that discouraged Handel's music interest while his mother supported him. Handel tried the local university unsuccessfully and dropped out after one year. He then left home and went to Hamburg. There he conducted at opera houses and quickly became the second violinist in the orchestra. Exposed to the Italian operatic style, Handel learned all that he could and applied it to his first opera, Almira, which he wrote at age 20. After his brief stay in Hamburg, Handel moved on to Italy and stayed there for the next few years composing operas and oratorios. When Handel left Italy he carried with him the reputation of a composer. Eventually Handel suffered from cataracts that lead to blindness and suffered from a series of paralytic strokes. Handel later died in London, England on April 14, 1759 and was buried in Westminster Abbey. One London papers wrote: "Last night about Eight O' clock the remains of the late great Mr. Handel were deposited...in Westminster Abbey... There was almost the greatest Concourse of People of all Ranks ever seen upon such, or indeed upon any other Occasion." 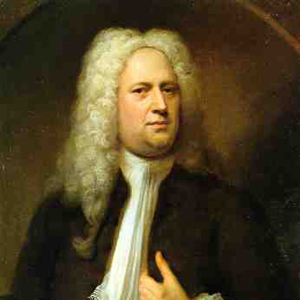 Handel was a truly well known and liked composer of his time.